The humble potato. It’s a staple ingredient of most main courses, but one that is underrated by many. The average Brit eats three each day. 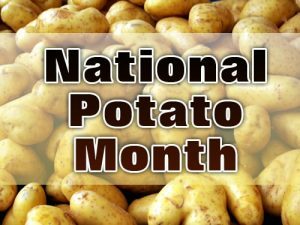 And in the United States, they celebrate their versatility with a whole month dedicated to potato lovers. Yes, February is National Potato Lover’s Month. This discovery got me thinking about potatoes, and how you can turn them from bland to brilliant. So here are seven ways you can cook your potatoes and make them the main attraction of any main course. Ah, the humdrum mashed potato. Some people love it, others hate it. Most make a mistake when preparing mash. Instead of boiling, draining and then mashing, after you’ve drained the potatoes, return the pot to the hob (on a very low heat) and cover for five to ten minutes. This removes excess water. When you then add a little milk and butter, it’ll taste delightfully creamy. But why stop there? Switch up by adding mustard or horseradish during the mashing process. You’ll never view mash in the same way again. 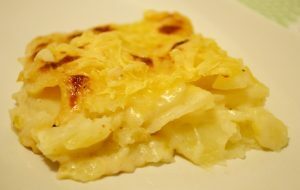 A dish that most only ever eat when they dine in a restaurant, but one that is easily cooked at home. Grate a few potatoes. Squeeze them to rid them of excess moisture. Then add some chopped, fresh herbs (rosemary is favourite), and a little salt and pepper. Fry in a pan until the rosti is crispy. For a tasty twist, once you’ve flipped the rosti over first time, grate some parmesan or Gruyère on top. You can thank me later! Sunday isn’t complete without a good roast dinner. Here’s a twist to try next time you cook the family a roast. First, don’t peel the potatoes. Leave them in their skins and boil them. Drain and return to the hob for a few minutes to dry them out. Now, put the potatoes into a clean tea towel one at a time, and gently squash them until they burst. Put the squashed potatoes into a baking tray. Drizzle with olive oil, sprinkle with salt, and scatter with a little thyme, rosemary, and crushed garlic. Place into a hot oven for 20 to 30 minutes. And there you have it – new-style roast potatoes that your whole family will love. The classic way to cook leftover potatoes. Delicious with breakfast, and ideal as an alternative to chips for mixed grills. Which is why you should always boil a few too many potatoes when preparing mash, roasties, or rostis. Add some cooked cabbage, carrots, sprouts, or peas, mash together and pan fry. Peel and slice your potatoes into fingers. Boil gently. Dry them out. Freeze them. Deep fry them. Drain. Freeze. Deep fry, drain, and sprinkle with salt. It’s a time-consuming job, taking all day. Well worth the effort, though. Remove the flesh from the skin and put to one side. Fill the potato skin with cooked and seasoned minced lamb. Mash the flesh from the potato, and place on top of the minced lamb. Sprinkle with grated cheddar cheese, and place under the grill until golden brown. A novel way to prepare shepherd’s pie! Have you got a favourite way to prepare your potatoes? Let us know how on our Facebook page. We’d love to hear from you. Of course, if you’d rather not cook, let us do all the hard work for you. Call us on (+34) 600 01 28 24 to book your table and enjoy an evening to remember at one of Torrevieja’s top 10 restaurants (as rated by diners on www.tripadvisor.com).